Here all pending and approved edits to a tag are shown. However, some of those edits may have been approved by clueless reviewers and should actually not have been approved. These reviews would then better indicate the quality of the edit. Multiple SMEs should review each edit. SMEs should be able to unilaterally reject or rollback edits. 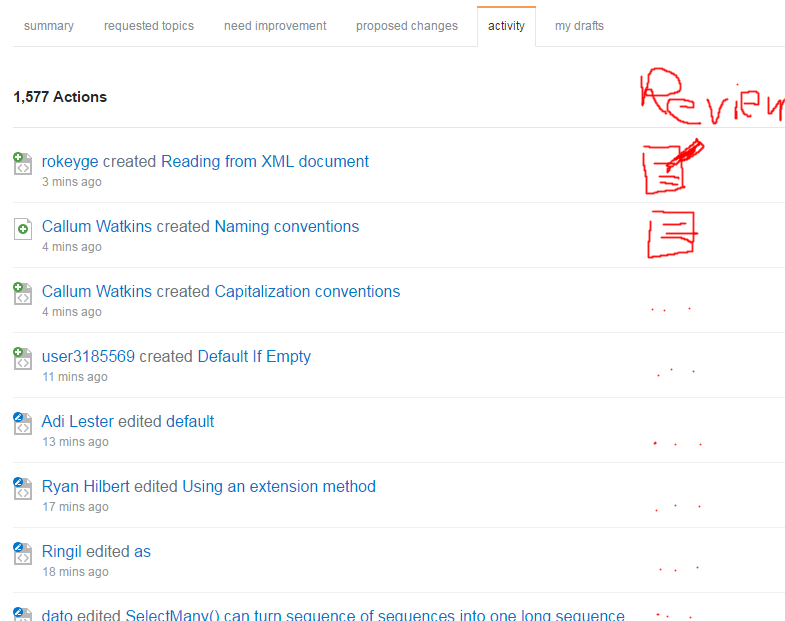 Edits/topics/examples that were reviewed should probably be indicated in some way on the documentation site. Topics/examples that are edited after a review should probably have their previous reviews invalidated in some way. Somewhat related: Documentation peer review, but that still seems to be about reviewing before approving an edit. 1: problem: how to define that someone is a Subject Matter Expert? For example if they hold a silver or gold Q&A badge holder in the given tag? They create duplicative examples, topics and even books. They create and / or edit examples that have little value to readers. They insist on adding their bit to some ill-conceived "kitchen sink" article. Unfortunately, Subject Matter Experts are not necessarily good at writing, editing and organizing documentation. There is also a role for people with Editorial expertise. I'm thinking that maybe we need a separate reputation scheme for the Documentation. Not the answer you're looking for? Browse other questions tagged discussion review documentation . Where to discuss how to organize documentation for a tag/topic? Why are edit suggestion review stats so skewed?